The best part of being on the ocean for weeks at a time, says Sonya Baumstein, is the stars. The worst? Being wet, all the time. Baumstein is an athlete from Orlando, Florida. She waited for weeks to set out in her custom-designed rowboat from Choshi. It is a Japanese port east of Tokyo. She is headed for San Francisco. With a few last-minute adjustments to her supplies and a brief call to her parents, she rowed out of the marina June 7. In her boat, she was just a tiny sliver on the glittering horizon. She hopes to finish the 6,000-mile journey by late September and become the first woman to row solo across the Pacific. Only three other rowboats have made the journey and no woman has ever done it alone. Having already rowed the Atlantic to the Caribbean, the 29-year-old has a pretty clear idea of what all those weeks at sea will be like. With relatively clear skies, she may get the peaceful, starry night she was hoping for. "It's very cool to see wildlife, but to watch the passing of the stars, because I row all night if it's good weather. To see the complete Milky Way," she said. Baumstein's rowboat, the "Icha," short for an Okinawan phrase meaning "once we meet we're family," is a lime-green, 23-foot vessel that weighs less than 660 pounds. It has no motor or sail. When the weather allows, she plans to row 14-16 hours a day. She will break her sleep to check her location. She hopes to stay within the 62-mile-wide Kuroshio current that arcs across the Pacific, at least for the first part of the journey. Baumstein rowed competitively in high school and at the University of Wisconsin, but was sidelined by a bad car accident. 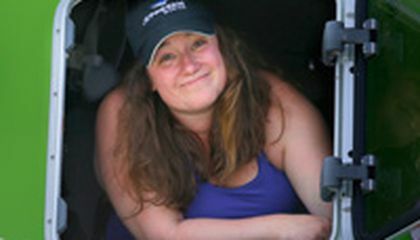 After recovering, she joined three men in rowing the mid-Atlantic from the Canary Islands to Barbados in January 2012. She has kayaked from Washington state to Alaska, stand-up paddle-boarded across the Bering Strait and bicycled 1,800 miles from the Mexican border to Seattle. She likens the Pacific challenge to "climbing K-12 without oxygen." "I worked three years of my life for this," she said. "It's 6,000 miles. It's going to get bad at times. I just keep my eyes on the prize." Andrew Cull, founder of Remote Medical International, which provides medical training and equipment to hard-to-reach places, says he believes she has the physical, emotional and mental strength to pull off the adventure. Even despite the potentially perilous weather and conditions of the North Pacific. "What's gotten her across oceans and to this point is sheer drive and willpower," said Cull. He is a sponsor and trained Baumstein for the paddle-board feat. "I was impressed by her drive and intrigued by her extremely intense and long adventures. I remember our second call; she was on a rowing machine for 24 hours straight with a partner while Skyping sponsors to sort out logistics," Cull said. Baumstein is not having a boat follow her for support. The cost would have been prohibitive and the fuel spent contrary to the green energy nature of her endeavor, she says. Instead she has a team providing support remotely from shore via satellite phone and GPS. As she travels, equipment on her boat will take samples and measure water conditions to help understand climate change and other phenomena. A weather router in the U.S. is helping her keep tabs on conditions. She expects to know at least 24 hours before she might need to tie everything down, adjust the ballast in her boat and take cover. She will eat and sleep in a tiny cabin. But even without extreme weather, Baumstein knows to expect plenty of hardship. The worst, she says, are moonless nights when she can't tell where the waves are coming from. Or when they will smash into her. "It's really frustrating because you have waves coming at you from every direction and you can't anticipate by seeing them. So your oars are popping around and hitting your body. You end up getting soaked a lot and hurt more often," she said. Whatever the conditions, she knows she'll be wet. "Constantly wet. Different versions of sticky wet from salt, with no control over it," Baumstein said. "Sometimes the waves can knock the wind out of you. They're so hard, they throw me out of the seat." Whatever the headwinds or tail winds, though, conditions are constantly changing. "That really is what's at play out there. Time. It either feels like it's going incredibly slowly those are the hard days or it goes quickly. It changes every time you're rowing. It changes minute to minute," she said. "Both fair weather times, really perfect rowing and the feeling of survival in bad weather, those are the two things that drive me to do this stuff," she said. "It feels like I'm living to my fullest ability." Critical thinking challenge: Why does Sonya want to stay within the 62-mile-wide Kuroshio current? Wanna buy The Flintstones home? I think that it is pretty cool to have a person like this row across the Pacific Ocean and come back safely. I think that this women should have been tired after she came back because she has been there for months and months constantly rowing to make it across the Pacific Ocean. I think that she needs an award for doing something not an ordinary person can do. She did something that risked her life. The good thing was that she came back safely. She could have died during her journey. Thank God for keeping her safe and watching her during her travels. I think this is cool because rowing 6,000 miles across the Pacific Ocean is a very difficult thing to do. Only 3 other people made the journey. I wish her luck as she strives to become the first woman to row across the Pacific Ocean solo. There are going to be bad times so I hope she makes the journey. I wonder how she is going to take care of herself. Sonya will have to find ways to avoid hazards like sharks. I am pretty sure that she is going to make it to San Francisco safely. Answer: Sonya wants to stay within the 62-mile wide Kuroshio current because of the first part of the journey. Sonya Baumstein set out from Coshi, Japan to sail the pacific ocean. Her destination is San Francisco and she hopes to make it by September. The journey is 6,000 miles but she is fully prepared to complete her goal. I think this article was really interesting and I find it cool how something like this is possible. 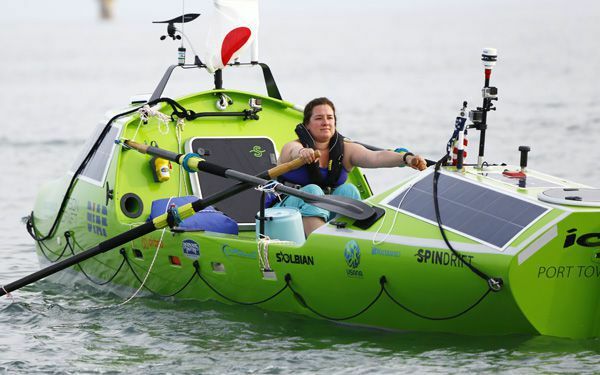 Sonya Baumstein wants to become the first woman to row across the Pacific Ocean by herself. She had a special boat called the "Icha" specially designed in Japan. Sonya knows that the journey will be hard, she is prepared to fight the waves and go nights with no moon. However, she is determined and has trained very hard. I think just the idea of a person rowing across the Pacific is amazing, let alone, by themselves (no pun intended). I am curious about what obstacles exactly Sonya will encounter and how she will prepare for them. I am also curious what will happen if a major obstacle were to get in the way, like if a whale starts trying to knock her off the boat. Sonya Baumstein must have been really determined and confident. Only a few people have tried to sale across the Pacific Ocean but they were not alone. Sonya is trying to become the first woman alone to sail across the whole entire Pacific Ocean. I wonder how she would eat, how many clothes she will bring, or how she will survive. She will be pretty dirty from all the water and days of not showering or washing properly. It is a hard and dangerous journey to go across the Pacific Ocean. I think that Sonya Baumstein must have a lot of faith in herself and is brave. Not many people would volunteer to go across such a long distance in the ocean. The ocean is a pretty big place and Sonya is going against it. A women is trying to row across the pacific alone from Japan to the U.S. And it will be hard. She has been training since she was in a car crash in high school. She is already on her way and she will do it if it takes forever. She has also done many long distance training. I think she will make it. When I get older I want to do something like her. This article is about a woman trying to be the first solo woman to cross the pacific. She's setting out from Tokyo and expects to arrive in San Francisco by September. I think it's pretty cool that some people are able to cross the pacific in a row boat. In this article it talks about how this woman wants to use her Robo designed by Japan with solar panels and high-tech devices including GPS is and etc. to row across the Pacific ocean all by herself. Only three people have ever done it and they are all men so she wants to be the first woman to do it . She has done so many things in her life that required very strong mental and physical health and strength so based on that and many other things people think that she can definitely finish this challenge of the 6000 mile journey. A woman is paddling across the Paciffic Ocean. She will become the first woman to do this alone. She has a special boat with rows to navigate across the Pacific. She will use the start to find her way to San Francisco from Florida. This would be really scary to be alone and hard work to always be paddling. I would not want to do this. This article is about an American rower named Sonya Baumstein. She is attempting to be the first female rower to row across the Pacific Ocean. She will be going on the 6,000 mile journey alone. She can't wait to look at the stars but fears getting attacked by waves. I think that it is a great experience for her. I also think that she should be prepared for getting hit by the waves.